After school just got a whole lot better with these crunchy, peanut butter cheerio treats that are super easy to make and so fun to eat! As you may already know, we love peanut butter, even my little one too! Reese’s Cups, pb & j sandwiches, cookies, ice cream, ect. We make, buy and devour anything peanut butter by the arm full. I have been wanting to make these treats ever since I brought home my first box of Peanut Butter Multigrain Cheerios two months ago. The concept of these bars is just like a rice crispy treat, only better! I loved these crunchy, peanut buttery treats with a kiss of chocolate throughout and I’m sure you will too; enjoy and happy no-baking! In a large saucepan over medium heat, melt the butter, marshmallows and peanut butter until smooth. Remove from heat and stir in the cheerios, once it comes together drop in the chocolate chips, minus 2 Tbs reserved for the top. Press the mixture into a greased 8"x8" pan and sprinkle the remaining chocolate chips on top, cool completely slice and serve. Thanks Natalie, I am always trying to improve and coming from you that means a lot, your pictures are great! Oh! These look scrumptious! I am always looking for ways to use up stale Cheerios and this is the ticket! Thanks!! 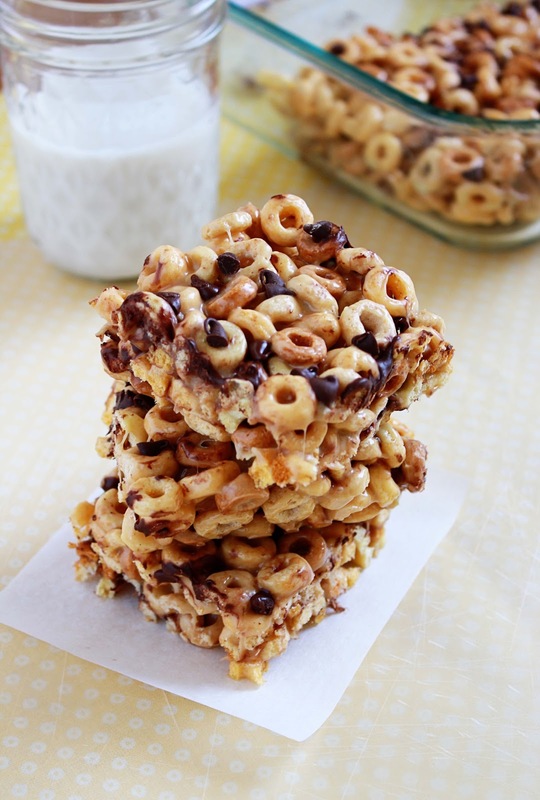 love your use of cheerios, chocolate & pb! heaven in dessert form. Saving this recipe! They look delicious! MMMMmmm, this looks yummy…and gives me some great ideas for a “homemade” cereal bar! You’re making me crave bad things! Delicious, bad things! Oh my! This is right up my son’s alley! Thank you so much for posting this one. I’m pinning it now to make soon! These look so good, Emily! Pinned and I will be sharing them in my no bake post! I’ve never heard of Peanut butter cheerios before, I don’t think we get them here. They look fantastic. Visiting from Saturday Dishes.